1) DO NOT USE THIS DATA AS DESIGN DATA. USE ORIGINAL DATASHEETS. 2) There is worldwide confusion about what is positive and what is negative when we write Uh-k is +50V and -150V. Uh-k=-150V means you connect + to the heater and - of your meter to the Cathode, and then read -150V. (Like this, and no other way!) May seem a silly advice, but it is a popular mistake. Version of ECC88 only for Televisions. ok between +120 and -250 V . This is a jewel. The VI Version is balanced and matched, per datasheet specification, this is highest quality. The rejects were probably sold a standard 6N1P, this is normal. ok between +120 and -250V. Low noise version of 6N1P. Large dimension ECC88, with higher dissipation. Electrically not compatible! Tube fraud: Unfortunally a big item particularly with this tube number. On internet auction sites, tubes are re-labelled, retro-gold plated, re-branded and used tubes are put in re-printed new boxes with the stamps ne-newed. It's an incredible mess at the moment. So you think you buy NOS, but they're not. Don't try to be Mr. Lucky on internet auction sites. They are waiting for you there. 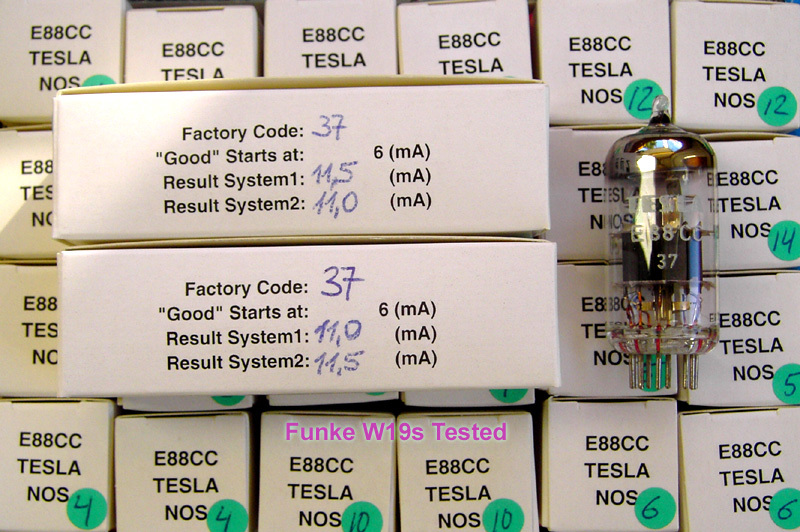 The most frauded tubes there are ECC803S and ECC88, because thes are practically unavailable as NOS tubes. Don't trust it when a sellers offers those repeatedly for low prices. This is not possible for the most wanted part numebrs. Buy only from reliable sources! Special attention needed: This tube excist as normal grid tube and as frame grid tube. The frame grids have generally better parameter stability, lower noise and lower hum. These are the later technology, and also a technology only very few could make. Frame grid wires can be as thin as 10um, which is technologically speaking a masterpiece of fine mechanics. The frame grid wire is so thin, when you open up a defective tube, you can not see it with the bare eye. To give you an idea, the size of a large bacteria is 5um. When frame grid tubes, we write it in the description. The Russians made very special quality grade 6N1P-EB. This is a much improverd version of ECC88 made, with higher voltage capabilities, higher plate dissipagtion, and better in many many ways. However they bias not as trhey shouls in all circuits, and have slightly lower gain. These have lower noise, and less distortion. Mind you they draw twice the heater current. So you may be able to use them in a ECC88/E88C ciruit, but first verify this with the seller of the amplfier, or try it at your own responsibility. Is your ECC88 microphonic? Try the DUENDE tube rings we sell. This may help you more than changing tubes. The Duende dampers are GUARANTEED to give an audible improvement. We have Money-back guarantee on those. Also you should try the Svetlana types 6N1P. The ones we sell, are "EB", also when not specified like this, it's what they are. Is your ECC88 humming or making noise? When no, then skip this text. 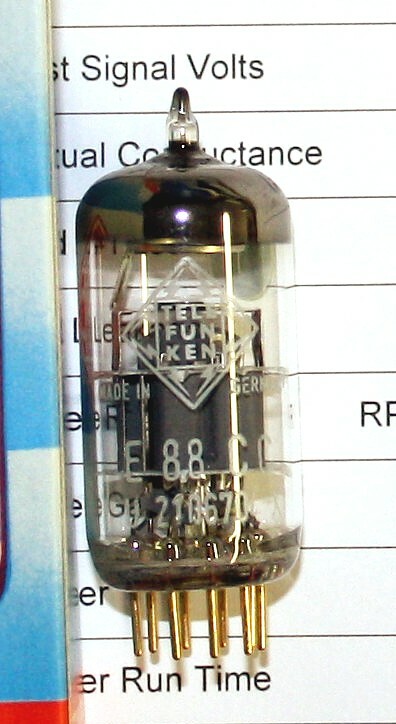 Used tubes of this type generally have more hum and noise. In many problem cases, the ECC88 is not used correct. Even with top-name amplifier manufacturers we see the same old errors, resulting from arrogancy, like not reading a datasheet. (reading datasheets in DETAIL seems to be a "no no" when somebody has some decades of experience. Strangely so, but I see it over and over again. When you refer to finest datasheet details, they say they don't need to know, they have already "30 years experience". Well, I think experience and detailed product knowledge is the same! Anyway, not reading the datasheet may work with most tubes, but not with all. The negative result is, end users have to swap tubes all of the time, and desparately try to draw conclusions from this. The next three boxes are a short overview of the most important thing to check, in case of a problem. Only do these measurements inside your amplifier, when you have experience with this. Leave it up to a technician otherwise. Low Noise types: Use 6N1P-EB or original NOS Tesla E88CC gold grid version. 1) Heater to Cathode: (Called Uh-k)Test with DC Voltmeter: Red Lead Pin4, and Black lead on Pin3 and Pin8. (see llimits in above table). This is a very critical one, and can cause a good tube to get defective, or give hum, sparks or other noise, when exceeded. Detailed Test report, comparing E88C JJ with TESLA NOS . Click here. EHX new production 6922 under the microscope. Click here. Not good. The only NOS that can be found still is Philips ECG, and Tesla. All others are gone, gone, gone. Folks, both TESLA and PHILIPS ECG are the finest NOS tubes you can buy at the moment, for a reasonable price. TESLA is even a frame grid tube! VERY IMPORTANT WARNING FOR FAKED ECC88 / E88CC - This is getting totally out of control at the moment. .Made in Holland. White boxes. Sorry, only one tube left. Check also next item, below here. New appearance, very nice and clear print. Test very good. Elektronska Industri, former Yugislavia. Factory does not excist any more: Original yellow-blue boxes. Made on Philips machines. Made in Holland. Clear white print like new, from spare equipment. Some tubes from equipment are sometimes actually never used. These appear like that. Perfect quality, good boxes. Made in USA. JAN tested, for higher reliability. JAN Testing is a military proces for lot qualification, which makes sure that weak production series will not pass as a whole. This is a very hard way of testing, since "good" tubes must still be rejected when they come from a production series where too many have failed the JAN tests. So you take samples, you overload them for a certain time, and when too many fail the whole lot is rejected. Now of course manufacturers could still sell such tubes on the commercial market, but the military refused to take those. This is the reason why JAN tested tubes are so often agvailable as commercial tubes also!! JAN was the first choice, the rest got sold commerically. Done so in 1985 when these were made, but JAN testing is still used for semiconductors as well. Read more about JAN TESTING here. Perfect quality, good boxes. On the tube glass is acid branded "made in USA" These test absoluetely excellent, strong emission and close to datasheet values. Nice green stamps. White box . Test good. Original box. <> Bottems, made in Ulm, Germany, with factory series numbers on the tubes. Excellent NOS. These come with Amplitrex computer test report. That is: All tube data there is, including gain, Gm, Plate impedance, grid leakage, etc, and compare it against "must be" values. From this you will see, these are TOP CLASS NOS tubes. For a pair, order two pieces, they are automatically packed as matched pairs if you do so. Please note with some (not with all) the print text has suffered somewhat from storage. It is not much but we have to say it. What is best, we had a small lot, and we have been able to select them all in perfectly balanced and matched pairs. This is not normal for E88CC, test values can vary widely, and you have to take them as is. However not with those! They test all at 15mA, with grid voltage variation of less than 0,2 Volt !! Here is a Link to all test reports. So you can see it yourself. You can order any pair you like, as long as we have it available. They are pre-selected in pairs. So if you order for instance tube #4 from this list, it is pre-matched with tube #8. If you want a single you can only take the ones we have, we can not break up a pair for it. Interesting detail with the tube box. When it writes on there "ECC88, 1" as you see on the picture here this means this tube was made in Germany, indicated by the number "1". Number "2" would mean outside Germany. This was told to me by a retired Telefunken Ulm Employee, so I think this is very reliable information. Click for high resolution picture here. Gold Grid Version. High Quality tubes from the Prague factory (Code32) . Original old blue boxes. These were made for the military, as you can see from the sword signs on the back side of the tube. This is probably the best ECC88 ever made. 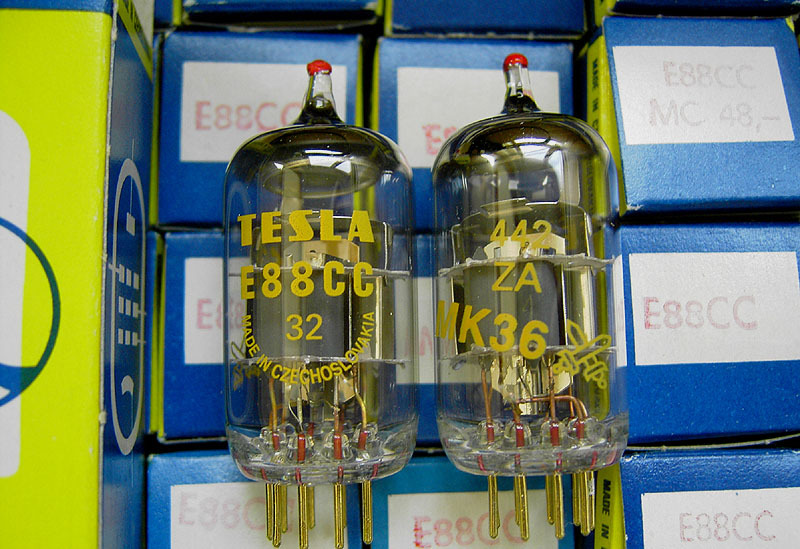 It is fully equivalent to the Telefunken ECC88 apart from the <> sign, and of course these TESLA have gold pins, which the Telefunken have not. For the rest every little detail is identical. This batch had very good values. The order numer 114-038-92 is for a Matched + balanced PAIR, with printed Amplitrex test report. So all four systems of this pair are the same. These are no JJ Tubes! Read some more about TESLA Tubes. Enlarge picture. Frame grid tube. Normal Pins. HQ tubes made for the Czech post, from the Rosnov factory (Code37). From Bulk pack. All from the same factory code. Very good selected, and this batch has very high test values. These are no JJ Tubes. Read some more about TESLA Tubes. Supplied in BALANCED, MATCHED PAIRS. PRICE IS FOR A SINGLE TUBE. Same as above. With good test value also, but these we could not match. At Funke W19 , "good" starts at 6mA so these are all very strong. If we add 4% per year to that, for inflation, we talk about 5200$ now.